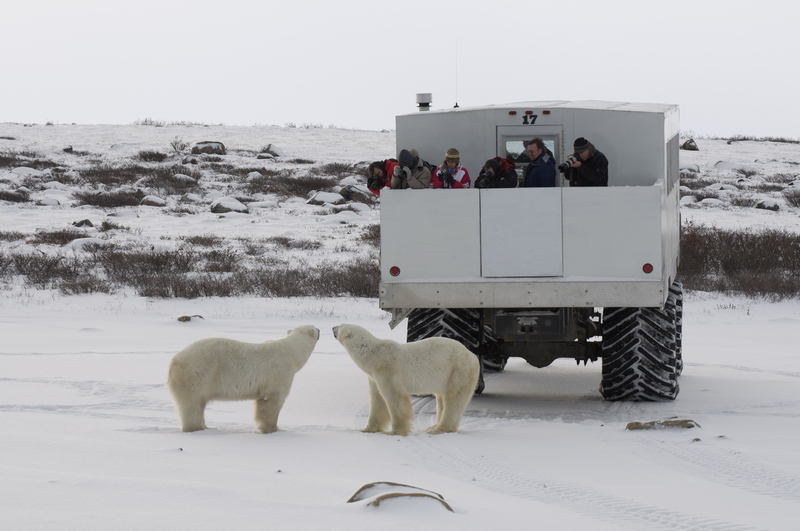 WINNIPEG, MB--(Marketwired - June 25, 2015) - Canadian adventure travel company Frontiers North Adventures has created an exclusive departure to experience wild polar bears near Churchill, Manitoba where guests will travel with world-renowned researchers from Polar Bears International. Conservation Journey: Polar Bears takes place November 4-9, 2015 during PBI's fifth annual Polar Bear Week, providing an experience combining both adventure and education. Guests will learn about polar bear habitat and species conservation awareness from PBI Chief Scientist Dr. Steven Amstrup, winner of the prestigious Indianapolis Prize. "Seeing polar bears in their natural environment is an awesome experience. We've been partnering with Polar Bears International for over a decade and together have crafted this new, unique adventure to inspire those of us wanting to learn even more about this iconic species with the intent of helping conserve it for generations to come," said John Gunter, president and CEO, Frontiers North Adventures. Frontiers North Adventures' Tundra Buggy®Lodge will be the group's base for the adventure, which includes three full days on the tundra and a behind-the-scenes glimpse of Buggy One, a mobile broadcast and research station that also serves as operation central for the live polar bear cams operated by Polar Bears International, explore.org and Frontiers North Adventures. "The tour allows people to see first-hand the work we do in polar bear conservation. We're working very hard to save arctic sea ice and sustain a future for polar bears. Our goal is to help educate and share our research so guests in Churchill can learn ways they can help," says Krista Wright, executive director of Polar Bears International. The Arctic ice season is 24 days shorter now than it was in 1950 as a result of climate change. This shorter season combined with a thinning of major arctic sea ice intensifies the challenges to the animals that call it home. Polar Bears International works year-round conducting research to find how changing ice conditions affect the health and population of the Arctic's most famous inhabitant and to develop solutions to these challenges. Guests will return home with valuable information about how climate change is impacting polar bear habitat, along with valuable wildlife experience from the frozen Hudson Bay coast. A portion of the proceeds of this trip will be provided to Polar Bears International in support of their programs and conservation efforts. You can help spread the word with the hashtag #frontiersnorth. For more information about the tour please visit frontiersnorth.com. Polar Bears International's mission is to conserve polar bears and the sea ice they depend on. Through media, science, and advocacy, they work to inspire people to care about the Arctic, the threats to its future, and the connection between this remote region and our global climate. Visit www.polarbearsinternational.org. The northern lights mesmerize visitors with Frontiers North Adventures in Churchill, Manitoba. Photo by Bob Debets. 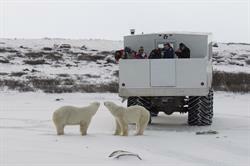 Travelers with Frontiers North Adventures get to see polar bears up close from the safety of their Tundra Buggy®. Photo by Bob Debets.